Do you have an overwhelming amount of accessories? Scarves, jewelry, hats, and even handbags? Especially if you store them in your closet, they can take up valuable space and leave your closet looking messy. 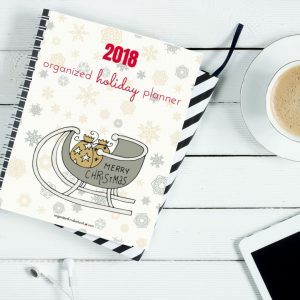 But even if you store them in a drawer, jewelry box, or hanging organizer, it can be hard to keep track of what you already have and keep them organized. The first time I tried to declutter my accessories, I tried to follow the principles in The Life-Changing Magic of Tidying Up. Some ideas in the book worked while others didn’t. 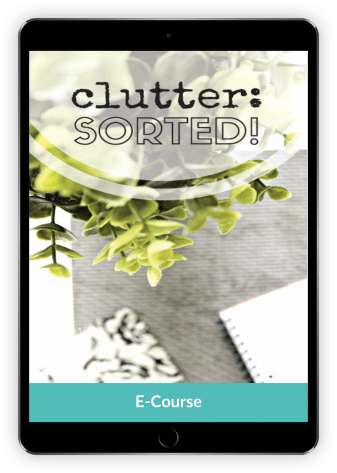 I finally started to make headway on my decluttering once I took the Clutter: Sorted course. 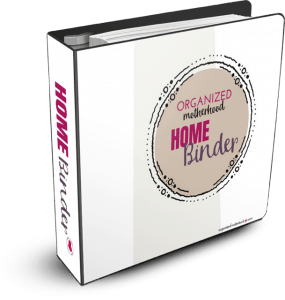 It breaks down your decluttering journey into 20 manageable weeks. Each week, you’ll focus on a different area of your home until you finally have a decluttered, liveable home. But the best part of the course is the hand-holding. Each week, you’ll receive an encouraging email with step-by-step instructions (and printables) to help with your decluttering tasks. You’ll also have lifetime access to the class, which includes videos, text, and more printables to help you. If you’re struggling to declutter your accessories, here’s how I finally managed to go through mine. For things like handbags, discard the obviously worn purses and keep the ones that you love and will use. In The Life-Changing Magic of Tidying Up, Marie Kondo suggests stacking purses inside each other based on matching colors and textures. I then I stored the purses in a large, clear tub that I had on hand. To preserve your current handbag, the book recommends cleaning out your handbag at the end of every day. While I love this idea because my purse is extremely cluttered, I have forgotten my wallet and phone at home on more than one occasion because I didn’t leave it in my purse. I love the idea of having a designated place for everything, but some things, like my wallet, belong in my purse! Try making it a priority to clean out your purse when you have a few spare minutes, like when you’re pumping gas in your car or on a designated day once a week. Empty it, clean it, and then only return the items that belong. If you use the same handbag every day, keep the essentials in it. If you frequently switch handbags, try storing items in smaller cosmetic bags that you can easily toss in a new bag. I save the free “sample” bags that I receive with makeup and use those to organize my cosmetics (lipstick, lotions, etc. ), feminine products, and even snacks for my kids. When decluttering your accessories, there may be some things that you don’t purge, especially if items have sentimental value, like the rosary I made to match my wedding jewelry. Store sentimental items that you don’t use in a separate area where they’ll be safe. You may want to go through smaller items, like earrings, to make sure each one has a mate. Also, check for broken or damaged jewelry. Make a point to either take it to a jeweler to get repaired immediately or discard it so that it doesn’t continue to clutter your drawer. If you have a collection of something that truly “sparks joy,” keep it well organized, but don’t feel pressured to get rid of it just for the sake of decluttering. However, make sure that you still love, have room for, and use everything you keep. If you store jewelry in a drawer, organize it by type. I store silver necklaces together, gold necklaces together, etc. If I have a jewelry set (like a necklace with matching earrings), I store that together, but otherwise, I organize by color and type. 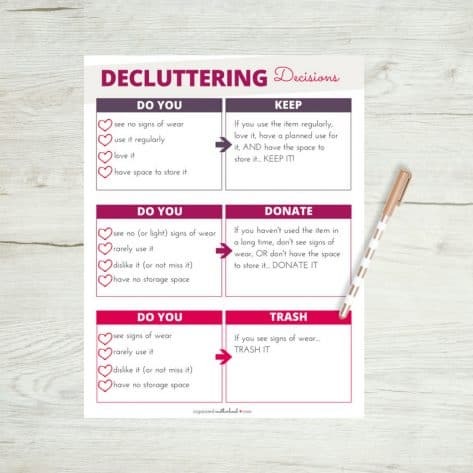 If you’re struggling to decide whether to keep an item, download the decluttering decision maker in the Organized Motherhood Resource Library. 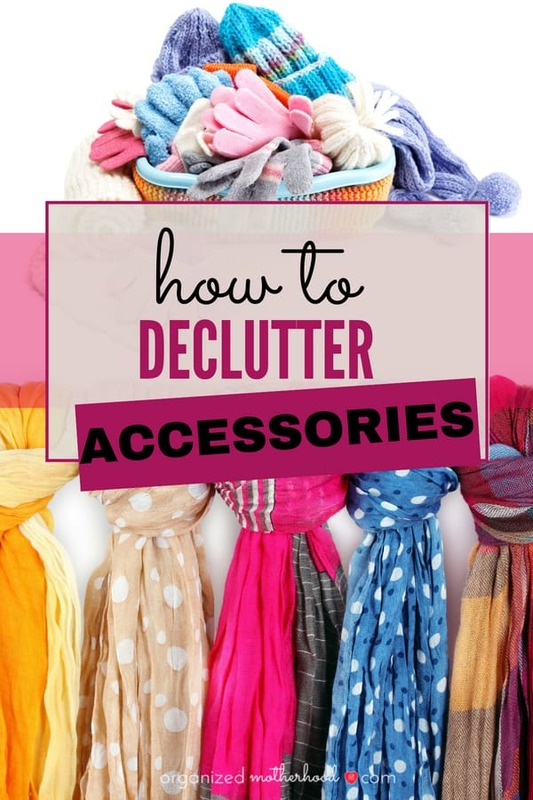 Similar to the way that you declutter jewelry, pull out all your scarves and check for signs of wear, tears, snags, etc. 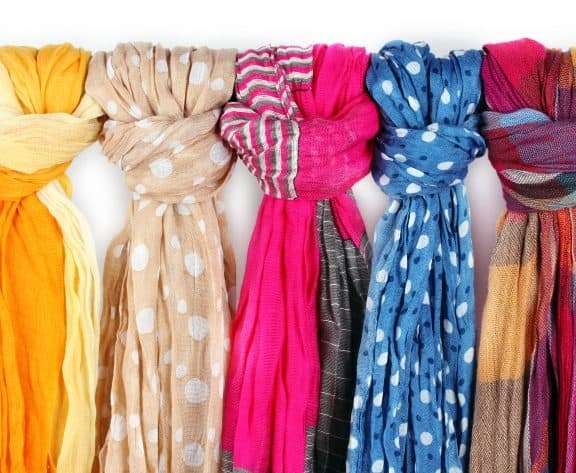 Trash any scarves that are worn and donate any that are still in good condition but that you no longer wear. To organize your scarves, use a hanging organizer, like this velvet covered hanger. How many pairs of shoes does a girl need? Decluttering shoes, especially if you live in an area with changing seasons, can seem fruitless. Of course you need boots for winter, sandals for summer, and everything in between. But the everything in between is where you can easily go wrong. When decluttering your shoes, pull everything out. Check for signs of wear as well as practicality. If you have a pair of stiletto heels that you never wear because they give you blisters, donate or trash them. But if you wear them a couple times a year when you go to a wedding or fancy event, then keep them. As you’re decluttering, be ruthless and honest with yourself. Do you really use each pair of shoes? Do they look good, feel comfortable, and serve a purpose? To organize your shoes, group them by type. 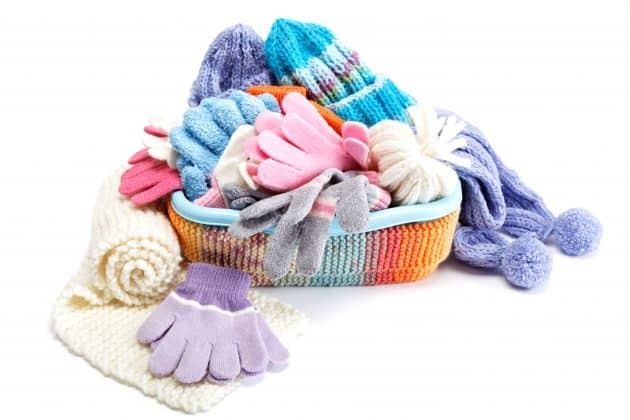 If you live in an area with multiple seasons, store shoes in bins or tubs during the off-season. Just remember to label the bin and get it out when the season changes. Especially if you live in a colder climate, storing outerwear can quickly become overwhelming. 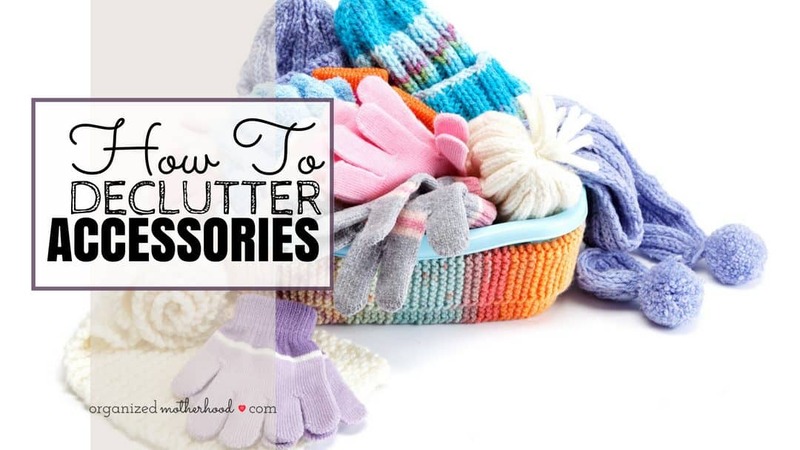 To declutter outerwear like hats, scarves, mittens, and gloves, pull everything out. Sort by type, like scarves in one pile, hats in another, etc. 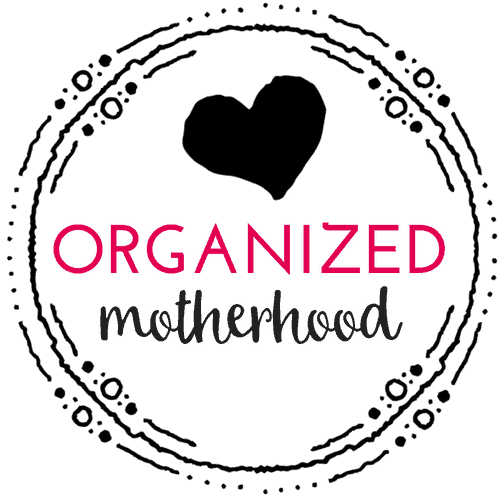 Once everything is organized, decide what to keep, donate, and trash. Once you’ve decluttered your outerwear, it’s time to organize it! You can either store like items together or store sets of items for each person in your family. In the winter, I store one complete set of outerwear (hat, scarf, and mittens) for each person in a bench next to our door. However, I also store extra items sorted by type in these clear plastic bins. This makes it so much easier to find items. When we’re in a rush to get ready for school, my son is able to quickly find his coat, hat, and mittens in the bench by the door. However, when the kids have been playing outside on a Saturday and need dry pairs of gloves, it’s much easier to go directly to the “gloves bin” in the closet than it is to sort through a messy bin of every item. It’s also easier to store items in the offseason if they’re already organized into bins. Clear tubs are especially helpful, but make sure to label them so you can easily find them next year! Decluttering, organizing, and storing accessories can be a long process, but you’ll find that you save time, especially when you need to get dressed in seasonally appropriate accessories!